We are families, like you who have been devastated by the effects of Li-Fraumeni Syndrome (LFS), a hereditary genetic cancer predisposition syndrome. Our hopes are to educate, raise awareness, and find better screening programs and treatments for LFS. By forming relationships with and supporting the variety of researchers and medical staff who can help achieve this, we wish to help provide a better understanding of a complex syndrome to those who need it. We welcome communication with all professionals, researchers, scientists, doctors, patients, and families in the hopes that the bridges formed by these communities will lead to an end of the devastating effects of Li-Fraumeni and other Li-Fraumeni-like syndromes. In November 2010, with the support of the United States’ National Institute of Health (NIH) and the world’s medical leaders of the Li-Fraumeni Syndrome, we all met in Washington D.C. at the first Li-Fraumeni Syndrome Conference. One month later, in December 2010, we officially formed the LFS Association and selected our inaugural Board of Directors. 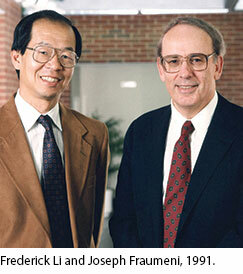 National Cancer Institute’s Symposium Celebrating 50 Years of Dr. Joseph Fraumeni’s Visionary Leadership (May 2014). See the agenda and video presentations for each speaker, to include the closing remarks on Dr. Fraumeni’s incredible accomplishments. It is with heartfelt appreciation that we acknowledge Sabre Digital Creative for their continued support with our website, which is our first ever communication tool linking our worldwide LFS community together. Without Sabre Digital Creative, none of this would have been possible – Thank you!